"Serve with potatoes and seasonal vegetables." Mix venison, stuffing mix, water, onion, 1/4 cup barbeque sauce, eggs, salt, and black pepper together in a large bowl until fully incorporated. 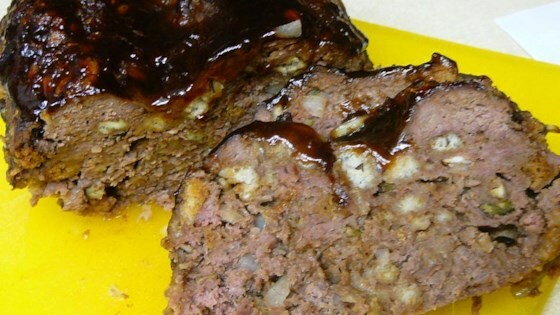 Shape venison mixture into a loaf and place in a 9x13-inch baking dish. Spread 1/4 cup barbeque sauce over the top of loaf. This was great! A nice change of pace with venison, My 6 and 7 years old couldn't get enough. If the 6 yr old liked it then I will using this recipe again.